If you don't have (or have never had) children, you may wonder why the "strategies" of the title are required. Let me explain. Six weeks of keeping two kids (who don't always often get along) entertained and adequately safe/hydrated/fed, not to mention HAPPY can be quite a challenge. If you happen to be a person whose default setting is "tightly wound" (as mine is) then it is vital to seize every opportunity to do the things that help achieve a state of calm and balance at such times - it makes it all much more enjoyable for everyone involved. In my case, this means fitting in some knitting or spinning wherever possible - we have lots of activities and trips planned and I have a feeling I may need it! Having several projects on the go at any time, including at least one which is "TV" knitting - by which I mean it takes no concentration at all - makes it possible to knit in the midst of chaos and make minimal mistakes, regardless of interruption. Suitable projects include anything plain which is knit in the round, simple socks (in colourful yarns), armwarmers/legwarmers, simple hats and cowls, many of the patterns by Martina Behm (especially Nuvem - huge, all stocking stitch, knit in the round with only a few increases every second row). Complicated projects (fancy lacework, thin slippery yarn on big slippery needles etc) will be kept to the period officially known as "after bedtime". I have learned the hard way that failure to do so may result in 'froject' status. Particular caution should be exercised on the occasions where "after bedtime" is interchangeable with "wine o'clock" - rendering this particular strategy null and void. Having a simple project / drop spindle and fibre in my handbag at ALL times. You never know when you'll get time to craft, especially if like me, you have slightly older children who are able to play independently with minimum supervision as long as they are within sight, or if you have a baby/toddler who may fall asleep while out and about. I wasn't a scout but I still like to be prepared. Should a 'simple' project get to a more complicated point (eg shaping, heel turns, anything involving maths), I plan to put it aside until "after bedtime" and work on something else - if necessary, I might cast on a few different pairs of socks to ensure they are at different stages and something is suitable for pick-up-put-down-knitting at all times. Two of my current WIPs are at the stage where there are some rows with lots of pattern repeats and I'm taking no chances. Dragonfly Wings for example, which is a simple enough lace pattern, now has a stitch marker at the start/end of each repeat - just in case. It's not something that I'd normally do, but in times like these I'm not taking any chances. Whippoorwill needed a 'pattern row' yesterday so I left it until bedtime and now I have several rows of plain sailing before any concentration is required. If all else fails, a spindle will be my salvation - total portability and there are no rows to finish. I can spin while waiting for the kettle to boil or the oven to warm up. I can spin at the park and on picnics, It's almost the ultimate summer holiday project.... if it weren't for sweaty hands and the possibility of felting. What will you be working on over the summer? Do you have any strategies of your own? Great post - my strategy is to make sure the pattern is at least written! I can cope with making most intermediate level patterns (which is primarily what I design) while the kids are around but I can't devise them. I tend to make sure the pattern is started in an evening though or any really trick bits are saved for then. Yeah, that treasured time when our little ones are sleeping needs to be very productive, doesn't it! This is fantastic and very well said. Thank you. My summer days are spent chasing a 5yr old and 2yr old and your tips are spot on! I have more knitting opportunity during the holidays with these strategies, as I don't usually knit during the day. It's definitely a case of having the right projects! Love this post! 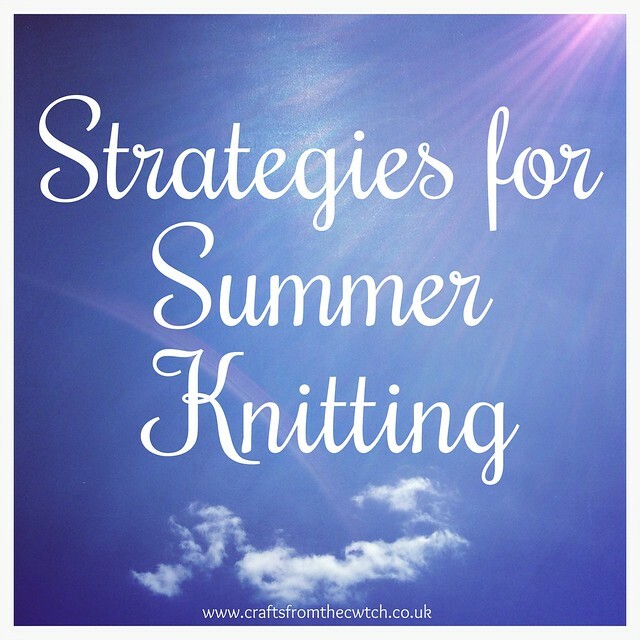 My summer is crazy with 4 little boys ranging from 1-6yr old so I can very much relate ... though so far I have been able to fit in some knitting, though there has been lots of garter stitch. My current WIP - a shawl - is getting too big to carry around, I am thinking it is time for some purse socks, lol. Wow! That sounds like a lot of work!!! Definitely time for some socks! I completely agree with this post, granny squares being my sock equivalent. I have also found that the ideal time to make something for my children (usually an amigurumi) they have been after is when they are around, they are much more likely to let me get on at least a little bit! This my year round strategy too. 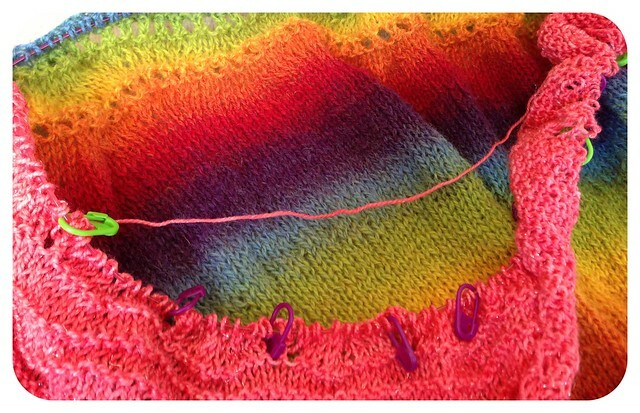 I have got better at picking up and putting down more complicated projects, if I didn't I would never knit them! Yes, I know, vacations with kids are mum's hardest times. Luckily, no timetable. I sure giggled at your wine o'clock comment! So true. You're so good about totin' a project 'round. I usually don't bring an on-the-go. I tend to knit while the girls are out of the apt. But at home they're old enough and good about playing on their own.